England take on France in a very interesting International Friendly on Tuesday night and Ladbrokes are offering a price boost on England to win. Find here how to back 25/1 England to beat France! Max bet £1! Money back if you lose! England enter this match on the back of a 2-2 draw in Scotland last weekend. They are unbeaten in World Cup qualifying thus far, winning four and drawing two matches. The two goals they conceded to Scotland are the only goals conceded during this World Cup qualifying campaign. Fancy England to beat France? Don'tm iss this offer at Ladbrokes! 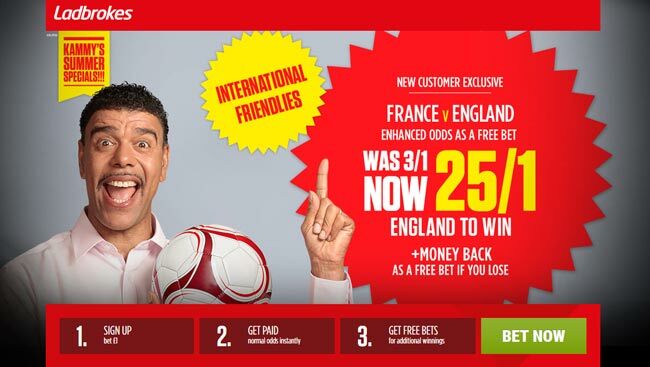 Join Ladbrokes via our special links and claim 25/1 for England to beat France! 3) Place a single bet of up to €/£1 on England to beat France in the 'Match Winner' market before the kick off. 5. The offer is not available through Telebetting, Text Betting, Ladbrokes Exchange or in Ladbrokes shops. 6. Customers that have an existing Online account with Ladbrokes do not qualify for this promotion. "Ladbrokes offer 25/1 England to beat France + money back"